Swarm or bees in building? 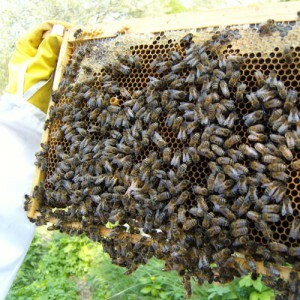 The Health of Honeybees is a large part of modern day beekeeping. Many people, both beekeepers and non-beekeepers have seen articles in the news about the vulnerability of the worlds bee population and many are interested in what is causing the problems being broadcast. Honeybees are no longer as able to survive as feral populations, certainly not in the UK where the effects of an untreated level of Varroa mites within a colony substantially weaken it to the point of collapse. The Integrated Pest Management system implemented by modern beekeepers aims to control mite numbers below an unhealthy level. These methods are discussed not just on beginners courses but are an ever present topic of conversation and research for beekeepers and scientists alike and are an important part of bee husbandry. Seasonal Bee Inspectors work to monitor the state of health/disease in bee colonies around the UK and are a first port of call if you suspect a problem in your colony. In the Merseyside area, our local, seasonal bee inspector is Wirral and Lancashire Bee Inspector Mark Mc Loughlin | Mobile: 07500 891425 | Email: mark.mcloughlin@apha.gsi.gov.uk. Our regional bee inspector for the Northern region, including Merseyside, is Ian Molyneux. This is a combination of strategies in place to assist beekeepers in managing the levels of varroa mites in their hives. Using information on the life cycle of the mite within the honeybee colony allows the application of suitable practices. So far, no treatment or method has been found which is 100% effective at removing varroa mites, so it really is a management process to monitor and keep mite numbers LOW. It is useful to supplement bees winter stores and in some cases to administer treatments, doing so through feeding. Heavy or Thick sugar syrup is given to bees when they need to store food, that is, in preparation for winter. Light syrup is thought to be stimulative and fed in Spring, effectively simulating a nectar flow. Things to consider when feeding – Only give syrup when the bees have stopped flying for the day to reduce the chances of robbing by other colonies. Further measures to prevent robbing can include reducing the hive entrance and being careful not to spill syrup within the apiary. Candy sugar is fed when the weather is too cold for the bees to evaporate the higher water content found in syrup and is used more when the bees stores have been depleted. Any feeding will excite the bees so care should be taken not to disturb their winter cluster in cold weather. To make Candy, heat the mixture to 117°C or 234°F (soft ball mark on sugar thermometer) and then cool the pan in cold water, mixing the cooling syrup at the pan edges with the warm syrup. As the temperature approaches and drops below 70°C watch for the solution starting to cloud at which point pour immediately into prepared receptacles before it sets hard.